Chicago is the backdrop for this year’s Blind Sailing World Championships. The competition pairs blind and sighted sailors to navigate a series of race courses. On a stormy day in Chicago, a dozen sailboats cut through the choppy waters of Lake Michigan. Their bright white sails light up the darkening sky, but its competitors are more focused on the sounds and feel of the water. 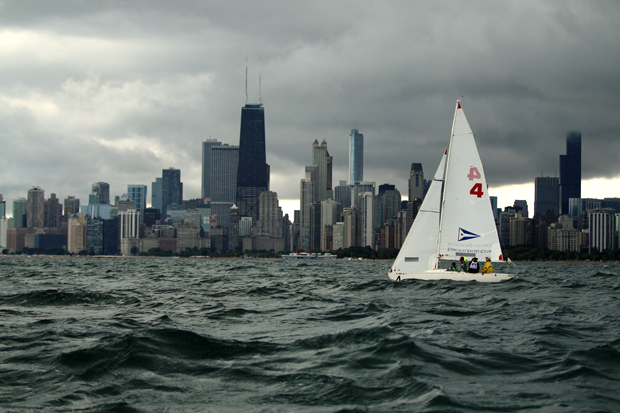 This weekend Chicago is home to the Blind Sailing World Championships. Organizers tried to fit in as many races as possible Friday to take advantage of strong, steady winds. The competition, run out of Belmont Harbor and hosted by the Chicago Yacht Club, features 14 teams from four countries. Teams are composed of four sailors, two of whom are sighted but have limited roles. For example, a sighted tactician keeps the racers apprised of where the other boats are and what they’re doing. Vicki Sheen and Sharon Grennan are the visually impaired members of Team Great Britain, the defending champions. The competition is divided into three categories, depending on visual impairment. Competitors in Blind 1 have no vision whatsoever. Racers in Blind 2 and Blind 3 can see a limited amount or very short distances. On land, Sheen gets around with the help of a guide dog. In a boat, she’s in control. “Once you’re on the water, there’s a massive sense of freedom,” Sheen said. Sean Kennedy is morning producer for WBEZ. Follow him on twitter at @stkennedy.